Fisker bought a plant in Delaware and promised to build vehicles there, but so far has not done much with the facility. The state has been picking up the tab on the electric bill for the empty electric car plant, say news reports. Somewhere in Delaware, a shuttered former General Motors plant, now bearing the name of Fisker Automotive, is idling away, but still managing to rack up a $400,000+ power bill. A bill that's being paid by the taxpayers in the State of Delaware. Fisker, which has had more downs than ups recently, cut back on aggressive plans to turn the idled GM plant into a 2,500 "green job" production facility and laid off everyone it had hired, closing the factory's doors. What seemed do-able in 2009 had become iffy in 2012 and since April, when Fisker left it, the idling plant has generated around $400,000 in utility bills to keep itself from dying completely. Utility bills that, Delaware Governor Jack Markell admits, the state has been paying. 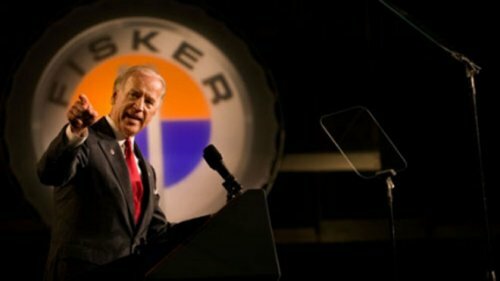 The governor's office says that the payment of the utilities is part of the grant deal worth tens of millions that Delaware penned with Fisker after Vice President Joe Biden (shown) promoted the idea of the California-based design firm building its cars in his home state. With such high-up friends, the path towards Fisker's glory as America's newest and brightest green automotive powerhouse seemed clear. Then came the first recall, then the fires and another recall, which happened, much to Fisker's dismay, during an election year.. When their friend in the White House was running for re-election. Not a good PR situation. Amidst these PR disasters, Fisker had to announce delays in the planned Atlantic vehicle's production; the car that was to be the follow up to the Karma and was to be built at the Wilmington plant. Then the flagship Karma was put on hold as another recipient of government loans and deals, battery maker A123 Systems (which produced the batteries for the Fisker Karma) entered bankruptcy - a situation which is still unresolved. Delaware has pledged Fisker $21.5 million, $9 million of which is a grant and the remainder of which is a contingency loan that may or may not be recovered should Fisker fail to find more financial backing. Fisker is already on the hook for $193 million in loans from the Department of Energy (DOE) and for millions more to the Silicon Valley Bank of California. This puts Delaware back at third in line to get anything should Fisker go bankrupt and assets be sold - which would likely mean the state would get nothing. News stories from Fox and similar Republican outlets were quick to draw lines between Fisker and the failed solar panel fiasco of Solyndra, which had received over half a billion dollars in government backing before its spectacular flop. With Fisker publicly looking for "partners" (read: finances), with production stalled and with public relations dwindling, the company will be hard pressed to keep up pretenses for much longer. With only 1,500 cars being sold to-date (by Fisker's own admission), it seems improbable that the company will recover in time to open and begin producing another model at the Delaware plant as promised. At least, not by 2014. But for now, Delaware's taxpayers will at least keep the light on for them in hopes that the electric dream will come to that big, empty building in Wilmington. Meanwhile, the state's debt climbs towards $15 billion; or $16,011 for every man, woman and child living there. Those people, of course, have to pay their own power bills. I wonder what the carbon footprint of $ 400,000.00 in elecricity use is? With nothing to show. Are all clean energy jobs like this? Depends on the power source, I guess. Given that it's Delaware, it's possible it's nuclear, so there's almost no carbon footprint, but plenty of spent fuel rods they can't send anywhere for dumping. Isn't this the reason why we all incorporate there? To fund these kind of things, and by all these kind of things I don't just mean this "green" car companies but the many, many others things we never hear about? Delaware has often been the corp choice because of its relatively lax publicity and trading laws. For private incorporation, it's a crappy choice, but if you plan to go public or large partnership, it's the bomb. For private corps, I'd always go with Nevada or Wyoming, both of which have great setups for small-scale incs. That aside, the state is one of a handful that have "balanced budget" laws for its state government that are routinely ignored (hence their $15B debt).